A cauliflower-date salad with pistachios, dill, and mint – easy for #vegan, #paleo, or #Whole30 diets. Cauliflower – Some people say you either love it or you hate it. 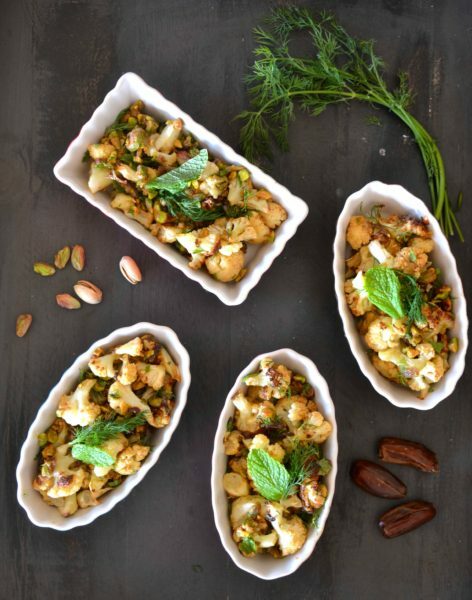 But with this Cauliflower Date Pistachio Salad, it doesn’t even matter if you like cauliflower or not. You’re going to love this salad and you’re going to want to eat it all the time – it’s that good. For those who are True Food Kitchen fans, this cauliflower date salad may look familiar. And yes, it’s a kinda-sorta knockoff of their famous cauliflower salad with harissa tahini. But we didn’t use harissa in this salad, and we beefed up the pistachio and dates to give it a little more interest… and the result is a hearty salad that could easily be a vegetarian or vegan main course. Just a note about sweeteners: We used Just Date Syrup from Spice Mama, which is a fun product we discovered at the International Food Bloggers Conference – and it’s literally just that, syrup made from dates. There is some debate about whether date syrup is “compliant” if you’re on a Whole30 diet. While technically it’s compliant (it’s literally just dates!) it’s not exactly compliant if you’re just using it as a sugar substitute as you make something sweeter. We’ll leave that up to you to gauge for yourself. 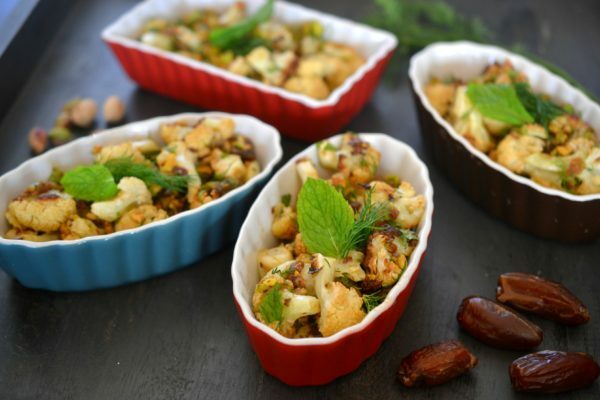 A hearty, sweet and savory salad that combines cauliflower, dates, and pistachios with a spicy tahini dressing, garnished with mint and dill. Preheat the oven to 350 degrees. Remove the stem and leaves from the cauliflower and break the florets into small pieces. 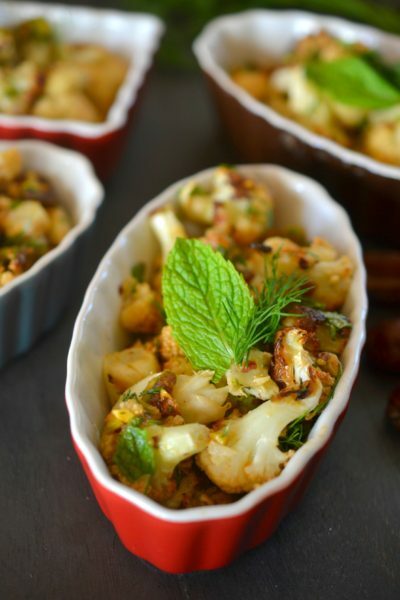 Toss the pieces with olive oil, then spread out on a baking pan and roast for 30-45 minutes, or until cauliflower is lightly browned and tender. Remove from oven, let them cool for 5 to 10 minutes, and then add them to a medium bowl. Toss with the dates and pistachios. But aside from Whole30, this recipe will fit right in with your paleo, plant-centric, vegetarian, and even vegan diets – plus it’s a perfect side dish or main course for October Unprocessed. We’re hoping that this salad will make an appearance at some point during this month of real food – and maybe, just maybe, it’ll make a cauliflower fan out of the skeptics. Oh YEAH you are speaking my language! Hahaha – You and me both, Dorothy!